Self-portrait - Self-Portrait's penchant for delicate feminine details shines through in the dainty composition of this light pink crepe mini dress. 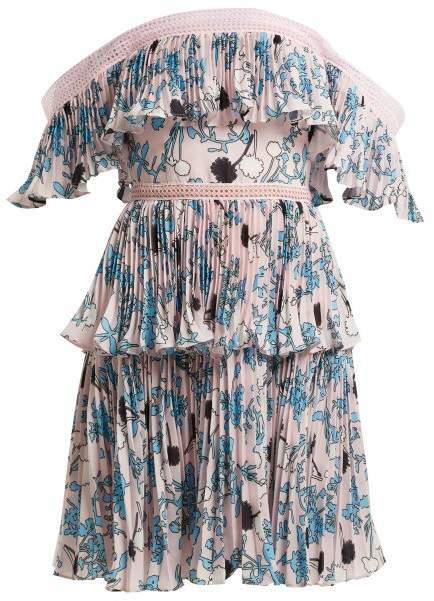 It's shaped with an off-the-shoulder neckline that's trimmed with geometric lace – note the coordinating insert across the waist – then falls loosely over the body with tiered, pleated panels printed with blue and black graphic florals. Keep the mood modern by styling it with plexi slingback pumps for a social-season occasion.